Cancer of the larynx is a particular danger for those who smoke and drink and must be detected early to aid recovery and beat the illness. 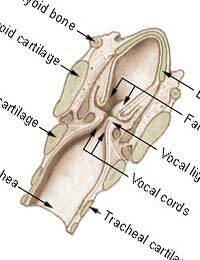 The larynx is commonly known as the voice box as this area is home to the vocal chords (also called the vocal folds) that produce sound by vibrating when air is pushed through them on exhalation. Like most other areas of the body, it is susceptible to cancer though some groups are much more at risk than others and lifestyle plays a large part of this. What Causes Cancer Of The Larynx? For some the cause of the cancerous formation may not be detectable and there is nowhere obvious to apportion blame. For most though, alcohol and smoking are to blame, and those who participate in both, make up the biggest risk group. It is much more common in those around the middle age mark and those of older age, and is more often seen in men than women. It has however been noted that those who smoke from an early age are putting themselves at great risk of developing early onset cancer of larynx. Cancer of the larynx may have no noticeable symptoms in the first stage or any that do exist are often mistaken for something else.Some people report feeling pain in the ears or head and don’t relate this to cancer at all; this is called referred pain.Common symptoms include feeling as though there is a lump in the throat, having to make more of an effort to swallow and often some discomfort. If the tumour is not exactly within the vocal folds but is located around the chords, there may not be any of these symptoms and swallowing can remain unaffected. It is also possible that the tumour can grow to being a noticeable swelling in the neck; if this has grown slowly, you may not notice it very easily yourself but others may comment on it. If the tumour is encroaching on your vocal chords it is likely that you will notice changes to your vocal function, most commonly, hoarseness will develop. There are three main treatments that can be offered for patients with cancer of the larynx, these are chemotherapy, radiotherapy and surgery. If surgery is an option, your voice may become permanently affected and not recover fully even after the treatment has long been completed. The surgical procedure may include using lasers to stem the growth of the tumour and destroy small tumours, partial excision of a growth or removal of the whole of the vocal folds. Chemotherapy can be used and this involves using drugs that target malignant cells and aim to destroy them and prevent any more growth. It is normally used in conjunction with radiotherapy or after surgery to ensure that any remaining cells that were not removable by the operation are targeted. Radiotherapy requires the patient to be exposed to high powered x-ray beams that are directly exactly towards the tissues containing the cancer. Again this may be used following surgery. Laryngeal cancer is much more common in smokers and those who drink large amounts of alcohol. It can be treated but as the symptoms can go unnoticed or undiagnosed in the early stages, the type of treatment offered may depend on this.